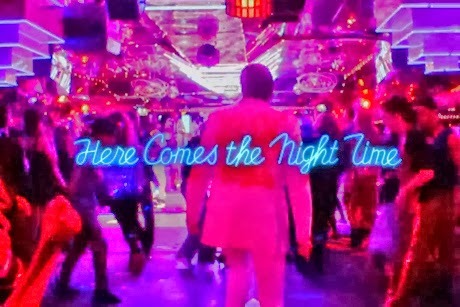 CONCERT ADDICT CHICK: Here Comes The Night Time - Arcade Fire's Post-SNL Concert/New Album Premiere Special!!! Here Comes The Night Time - Arcade Fire's Post-SNL Concert/New Album Premiere Special!!! NBC earned some major points in my book on Saturday night/Sunday morning from 1-1:30am when they aired Arcade Fire's Roman Coppola-directed post-Saturday Night Live mini concert which featured three (3) new songs off AF's upcoming 4th studio album Reflektor. I know I'm biased because I'm already such a big Arcade Fire fan but I can honestly say I LOVED all 3 new songs (Here Comes The Night Time, We Exist & Normal Person) on my very 1st listen &, now, after having already watched this 22 minute spectacle 4x times straight through, I'm 100% OBSESSED with all 3 new songs. I also think this mini concert production was absolutely flawless (i.e. the costumes, the colors, the lighting, the editing, the energy, etc, etc). The celebrity cameos (i.e. James Franco, Michael Cera, Bill Hader, Ben Stiller, Zach Galifianakis, Bono, Rainn Wilson) were fun too. Aziz was my fave. I'm dying to hear Reflektor in its entirety when it's released on October 29th but I'm keeping my fingers crossed I'll be able to get my hands on a bootleg copy sooner than that. I'm even more excited to see Arcade Fire live again. Another concert tour HAS to be on horizon &, if & when Arcade Fire come to your town, you better go see them!